Want to learn all about ferret diseases? Caring for ferret health means knowing about how to keep them safe and well. So, we’ve put together this handy guide so you know what to look for and what to do! Ferrets are one of the most common exotic animals that we own as pets. Almost every person in the western world has probably seen or at least heard of a ferret. However, ferrets are prone to a number of common diseases. 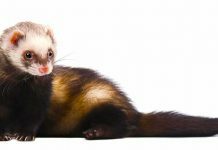 Some of these are more serious than others, of course, but it extremely important to learn about all the potential diseases a ferret might face in order to be able to give your ferret the best care possible. Luckily, that’s exactly what we’re going to talk about in this article – ferret diseases. 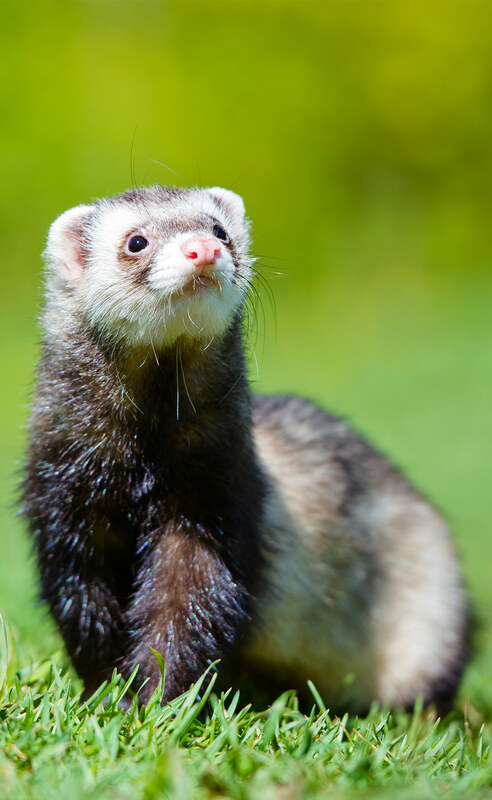 We’ll look at these most common ferret diseases, take a look at some common symptoms, and then wrap it up with some information on taking care of a sick ferret. Insulinoma in ferrets is a tumor on the pancreas. Simply speaking, this ferret tumor interferes with insulin production in ferrets. Insulin is used to regulate blood sugar and help the body use the energy it digests. Without proper amounts of insulin, it is impossible for a ferret to control blood sugar amounts and utilize the energy in his or her blood. Symptoms of this ferret cancer include: weakness, weight loss, tremors, lethargy, and confusion. These symptoms can progress into seizures and coma if not treated. Surgery is often the treatment of choice for this disease. Furthermore, diet can also play a huge role in pre-surgery treatment in order to ensure the ferret is healthy enough to undergo surgery. Luckily, as long as treatment is sought, this disease is very curable with surgery. Many ferrets go on to live their full lifespan. Adrenal disease is one of the most common ferret diseases. Basically, this disease is caused by a tumor or lesion on the adrenal glands. This tumor or lesion interferes with the sexual hormones produced by the ferret. One of the most common symptoms of this ferret cancer is hair loss. If a ferret is losing hair on his tail, it is almost always a sure sign of this disease. Other signs include things such as a previously neutered male exhibiting sexual behavior, loss of appetite, a lethargic ferret, excessive grooming, and increased thirst. The exact cause is generally unknown, though it does appear more in females than males. Luckily, there are a number of treatments available. The melatonin implant is one of the most common, though it does come with a number of side effects. The deslorelin implant is becoming more and more common. It doesn’t exactly cure the disease, but does go a long way in managing symptoms. Surgery where possible is also common. Aleutian Mink Disease Virus (ADV) is caused by a parvovirus and causes organ failure in ferrets. Fortunately, it’s not too common. But it can be passed from the urine and bodily fluids of other ferrets (as well as other members of the Mustilidae family). It causes symptoms such as progressive wasting, hind end paralysis, ferret shaking and weakness, incontinence, and lethargy, among other things. Basically, ADV causes the immune system to not work properly, accumulating plasma cells in organs and antibodies in the bloodstream. Ferrets with the active form of the disease often die of liver or kidney failure. Sadly, ferrets can carry it without showing symptoms, only to pass it on to other ferrets. If you have more than one ferret, and one has ADV, you’ll need to test them all. Though this isn’t technically a ferret illness, ferret fleas can cause all sorts of issues, along with ferret itching. The surest sign of this disease is, well, seeing fleas on your ferret. You might also notice “flea dirt,” excessive scratching, chewing, and biting. You might occasionally see dried blood in your ferret’s fur. While completely eradicating fleas is difficult, a bath is a great place to start. Regular bathing, as well, should be done weekly for several months. You vet might recommend topical creams or sprays to control the flea infestation. This is one of the most deadly ferret diseases. The fatality rate for ferrets with distemper is virtually 100%. Luckily, though, there is a vaccination against this disease. However, this vaccination requires a booster yearly. Prevention is truly the best medicine in this case. Now that we’ve looked at some of the most common disease, let’s explore some common sick ferret symptoms. That way, you’ll know what signs to look for and what they might mean. But symptoms of ferret illnesses tend to be quite general, and can be caused by any number of ferret health issues. Just so you know, the ferret nose is not necessarily an indicator of health, whether it’s wet or dry. But if something is happening with the nose, such as a runny nose, this might be a symptom of something else. Sneezing in ferrets is usually harmless. 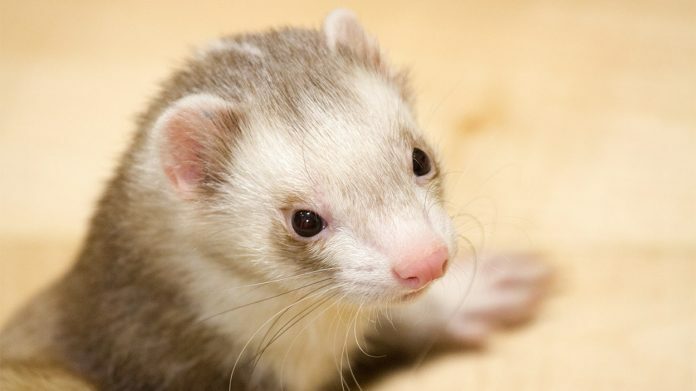 Commonly, ferrets sneeze for the same reasons we do – dust, pollen, allergies, and respiratory issues. Sometimes, sneezing can be one of the ferret cold symptoms. However, as long as your ferret is eating and drinking, there shouldn’t be reason to worry. Remember, if you are concerned about your ferret in any way, it is always best to have her looked over by a vet. It couldn’t hurt! Coughing is generally pretty common in the weasel family. It can be caused by a number of things, such as minor throat irritation, hairballs, a cold, or a piece of food that was eaten too quickly. Coughing that gets continuously worse, however, can be a sign of an enlarged heart. This is not very common in ferrets, but it is always best to get your ferret checked out by a vet if coughing continues for more than a week and gets worse. Ferrets don’t throw up as often as some dogs or cats do, but they do regurgitate their food, and for similar reasons. But if your ferret has been vomiting for 24 hours, you should see a vet. Ferrets are small creatures and can easily get weak and dehydrated from ferret throwing up issues. This is one of those non-specific signs of a sick ferret that can mean a number of things, from diet problems to infection. Pay attention to color and other details for when you visit your vet, since this can help determine what your ferret is experiencing. There are many causes of diarrhea in ferrets. It could be anything from a bacterial infection to a viral infection or a parasitic infection. Of course, the only way to figure out exactly what is wrong with your ferret is to take him or her to the vet. This is especially important if the diarrhea is very severe or continues for more than a couple days. 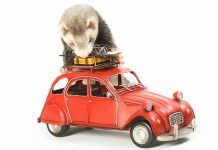 Your vet can run the appropriate test to figure out just what exactly is wrong with your beloved ferret and can recommend the appropriate treatment for their specific situation. One of the most common causes of seizures in ferrets is insulinoma. Seizures caused by this disease happen due to a drop in blood sugar. This is a very serious condition that can easily lead to a come if left untreated. Always take your ferret to the vet if he experiences a seizure. This is an emergency. Ferrets have a high incidence of cancer, which means you should have any tumors, or growths on the skin, checked out as soon as possible. Some may be benign, but one study found that over 50 percent of ferrets suffered from insulinoma or adrenal disease. These must be checked out, and removed with surgery or another therapy if malignant. Your ferret may show other general symptoms as well, from ferret shaking and weakness to weight loss. You should know that some of these are associated with Aleutian disease as well as Insulimoma and other serious ferret illnesses. Sometimes such symptoms aren’t dangerous. It often depends on context. Some shaking or tremors in ferrets may be normal, for example. Skin and ear issues might be caused by allergies (these aren’t that common in ferrets), or just look like allergies. They may be sensitive to shampoos, or they might have mites or fleas, or it might be diet or hormones. A ferret losing hair on the tail isn’t a reason for alarm. It may happen every summer to middle-aged or spayed/neutered ferrets. This condition is called alopecia. On the other hand, tail hair loss in ferrets can also mean a tumor, adrenal disease, an infection, hormone, parasites, or diet. Weakness in ferrets might be associated with something like Aleutian disease, but may also be a sign of ataxia, a sensory dysfunction that causes head tilt and lack of coordination as well. A lethargic ferret could have swallowed something she shouldn’t, or be showing signs of Insulinoma. Your ferret losing weight could be seasonal and therefore not at all worrisome. Or weight loss could be a sign of gastrointestinal distress, or ADV, or lymphoma. A ferret grinding teeth could have a hairball, or Helicobacter Mustelae (a bacterial infection that causes a gastrointestinal disease affecting ferrets). Ultimately, you know your ferret best. If you are worried, and if the symptoms persist, go see the vet. Health care for a sick ferret can feel overwhelming. However, it is very important that you care for them as well as you possibly can to ensure their recovery. There are a couple things that you should keep in mind when it comes to caring for a sick ferret. Always follow your vet’s instructions. This is very important. You vet knows the best treatment needed based on the disease and your pet’s situation. He or she may prescribe ferret medicine or ferret antibiotics. Don’t be afraid to ask questions if you’re confused about a particular instruction. Stick to the ferret medication schedule as well as you possibly can. It is very important that you give your ferret the appropriate dosage at the appropriate time. If you miss a dose, consult with your vet to figure out the best course of action. Provide your ferret with plenty of fresh food and water. Unless your vet instructs you otherwise, you should make sure that your ferret has access to fresh food and water. Both are necessary for your ferret’s recovery. Keep the environment calm and quiet. While it is impossible to keep your house completely quiet, now is not the time to be having house parties. Stress can interfere with your ferret’s recovery. Can Ferret Diseases Spread to Humans? One thing you should also know is the answer to the question, “Do ferrets carry diseases?” Because they do, and they can pass them along to the humans that care for them. You can get fleas, mites, bacterial infections, and parasitic infections from ferrets, along with rabies. In some areas they must be vaccinated against rabies. It is rare, but if you’re caring for a sick ferret, please take precautions. Wash hands after contact with ferrets, their stool, their bedding, and their cage. Make sure to have your ferret checked out frequently by a vet. Having a sick ferret is always worrisome. We all want our beloved pets to be happy and healthy. When a sickness or disease interferes with that, it can be very stressful. However, it is important to remember that you are your pets’ advocate. It is up to you to get them the care they need. Weiss, C. A et al (1998). Surgical treatment and long-term outcome of ferrets with bilateral adrenal tumors or adrenal hyperplasia: 56 cases (1994-1997). Journal of the American Veterinary Medical Association, 34(6). Rosenthal, K. L. et al (1993). Hyperadrenocorticism associated with adrenocortical tumor or nodular hyperplasia of the adrenal gland in ferrets: 50 cases. Journal of the American Veterinary Medical Association, 203(2). Murray. J. (2005). Melatonin implants: an option for use in the treatment of adrenal disease in ferrets. Journal of Exotic Mammal Medicine and Surgery, 3(1). Chitty, J. (2013). Adrenal Disease in Ferrets. Companion Animals, 18(2). Weiss, C. A. et al (1998). Insulinoma in the ferret: clinical findings and treatment comparison of 66 cases. Journal of the American Animal Hospital Association, 34(6). Stephensen, C. B. et al (1997). Canine distemper virus (CDV) infection of ferrets as a model for testing Morbillivirus vaccine strategies: NYVAC- and ALVAC-based CDV recombinants protect against symptomatic infection. Journal of Virology, 71(2). Morrissey, J. K. Emergencies of Ferrets. Merck Veterinary Manual. The Center for Bird and Exotic Animal Medicine, Cancer in Ferrets, Cascade Kennels. 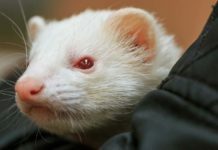 American Ferret Association, Inc. Aleutian Mink Disease, a hidden danger to your ferret. Centers for Disease Control (2017), Ferrets. Previous articleLemurs As Pets – Can You Keep A Lemur in Your Back Yard? Next articlePet Rats – Could A Rat Be Your New Best Friend?